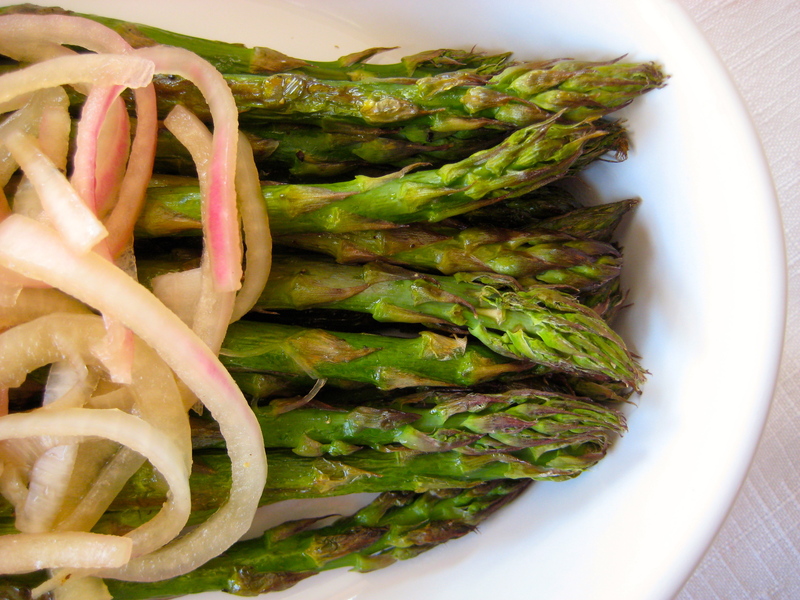 These pickled onions are delicious with the roasted asparagus, but consider saving the leftovers for atop your favorite veggie burger—the best excuse to fire up the grill. Put the cider vinegar, sugar, and salt in a glass bowl. Whisk until the sugar and salt has dissolved. Add the red onion, making sure it is completely covered. Cover and refrigerate for 24 hours. Before serving, preheat the oven to 425 degrees F. Toss the asparagus with the olive oil, and place on a baking sheet in a single layer. Sprinkle with salt and pepper. Roast for 12 to 15 minutes, shaking the pan mid-way, until tender crisp and browned. Serve warm with the pickled onions. Though asparagus is no longer in season, versions of this dish make its way into my weekly dinners because it’s super easy and I like the simple flavors. Lately I’ve been making a version with some local black walnuts and broccoli from my CSA, with maple syrup instead of the tofu. This easy dish puts simplicity in the foreground–the perfect solution for a busy day when cooking isn’t on the radar… but you want a cooked dinner. Preheat oven to 425 degrees F. Toss the asparagus with the olive oil and sprinkle with the salt. Bake in oven for about eight to 10 minutes, until tender crisp. Meanwhile, heat the oil in a skillet over medium-high heat. Season the tofu with the salt, then fry, about three minutes on each side, until golden. Reduce to medium-low, add garlic, and stir until fragrant, about one minute. Add pine nuts and stir for about another 2 minutes, until their nutty aroma appears. Drizzle in the agave nectar, and stir all ingredients together, until tofu is coated. (Add a dash or two of water if it gets too sticky). Remove from heat. 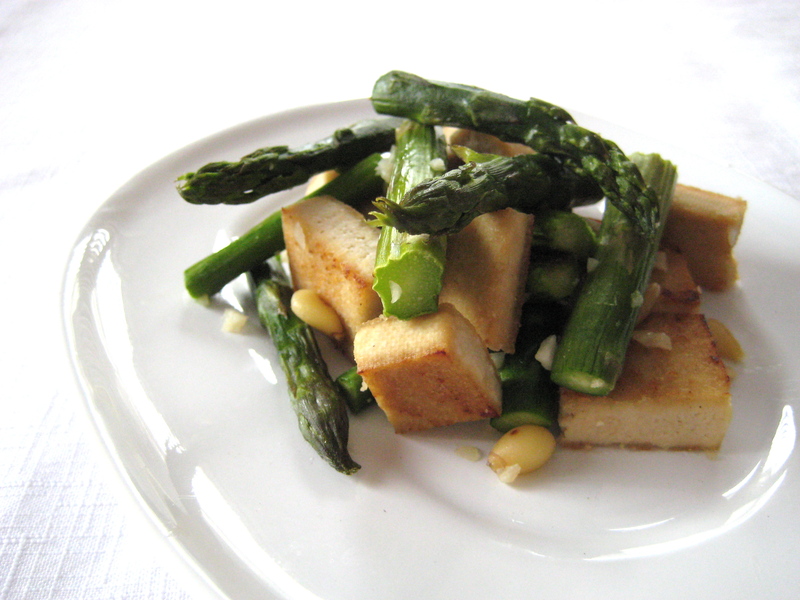 When the asparagus is finished, toss it with the tofu mixture. Serve warm.